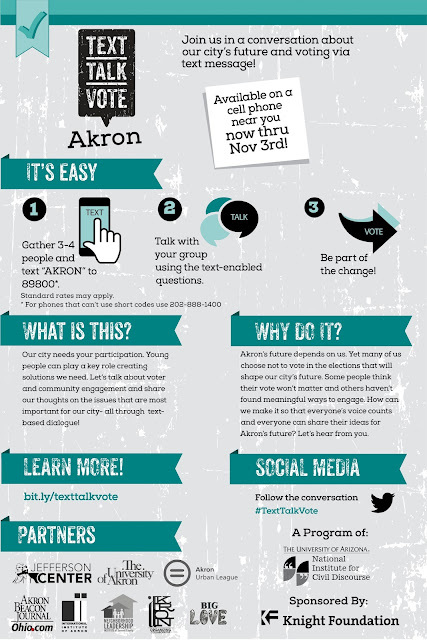 Akron2Akron is all about bringing the community together, that's why we invite you to join us in a conversation about our city's future and voting via text message. Before November 3rd, gather 3-4 people and text AKRON to 89800. Talk with your group using the text-enabled questions. Vote and be a part of the change! Our city needs your participation. Young people can play a key role creating solutions we need. Let's talk about voter and community engagement and share our thoughts on the issues that are most important for our city- all through text-based dialogue. Akron's future depends on us. Yet many of us choose not to vote in the elections that will shape our city's future. Some people think that their vote won't matter and others haven't found meaningful ways to engage. How can we make it so that everyone's voice counts and everyone can share their ideas for Akron's future? Let's hear from you! Watch the video posted above to see how simple it is. You can do this with friends, colleagues, civic groups - anyone! Just as long as you text, talk, and vote!